Q1: What was the task given to him by Lincoln? A1: he was told to go through the south to make advances in the war to get Lincoln voted back as president. Q2: was he successful in going through the south? A2: yes he went through the south with a tactic called total war which is destroying anything that may have military value. 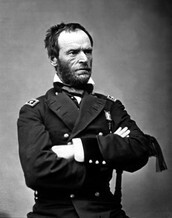 He went through the south destroying every thing that could be useful and ultimately ended up ending the war.